This is a really unusual 25 gram and 2.15" by 0.5" by 0.4" Prophecy Stone wand (aka ‘Vision Stone’) from the White Desert in Farafra, Egypt. These are actually a pseudomorph of hematite, limonite, goethite after marcasite … and if you look closely, you can see the original crystalline structure of the marcasite. A pseudomorph is a mineral that appears in a form other than its own crystalline structure, having totally replaced another, but the appearance and shape of the original mineral is retained … like a mold. The color is a dark, chocolate brown and the surface has an almost waxy feel, smooth and warm to the touch, but clink two together and there is a metallic sound. She is a long, lightly-knobbed wand with one rounded end and a flat base … and she is utterly perfect and ready to partner with her special Keeper. The White Desert is mystic, magical and formidable. It is part of the vast Sahara and Farafra is one of the five oasis within it. The sand is calcium rich and the rock formations are surreal and yet, the only sentient life for miles. It is no wonder that it is a resource for some of the most powerful stones in the world. 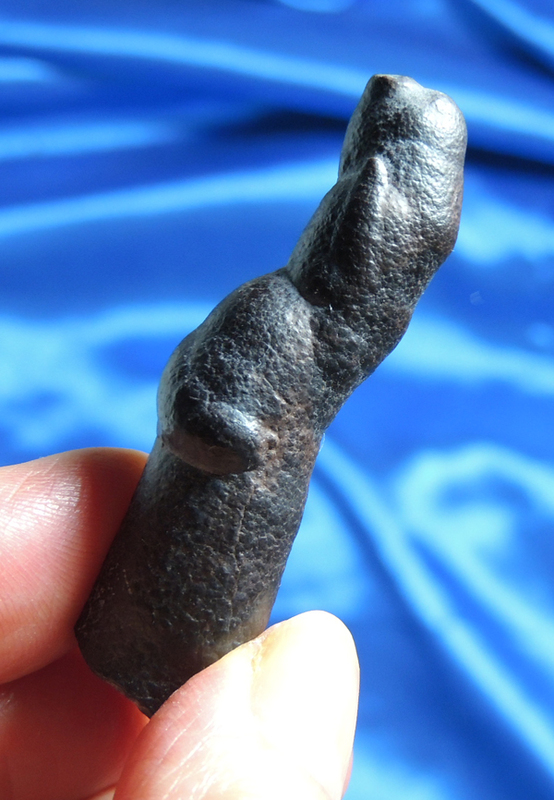 Look at the Prophecy Stone … dark, brown and unassuming … yet pick her up and you are in for a surprise! Brown stones are grounding, right? Not this one! She will literally take your breath away as she clears the Crown and starts the Third Eye to pulsing! These stones have long been sought after and treasured by those seeking visions and once you hold one, you will understand why. My first time working with one had me sitting quietly and going with the upward sweeping sensation. Tears poured down my cheeks and the opening was amazing … I felt like I could barely walk … it was so amazing! Like the Moz, each is unique to a Keeper and will open specific aspects of your psychic abilities. All I can say is ‘hold onto your hat’!